I know I haven't posted in forever but I feel like projects are happening so fast that I've barely stopped to take pictures much less blog about them. The end of the summer brought with it many evenings processing mainly tomatoes and beans from our garden as well as other wonderful produce I picked up through farmers markets and suppliers looking to sell their organic harvests at a great price. I've filled the pantry with an impressive bounty of our favorite foods. One project I snuck in while in the middle of about 12 others was our family Halloween costume. The Snickerdoodle originally wanted to be a cheetah and he wanted Mr. Mischief to be a deer so he could chase him and try to tackle and eat him. While this made me laugh, I couldn't do that to the little guy so I had to think fast and come up with a better costume idea. 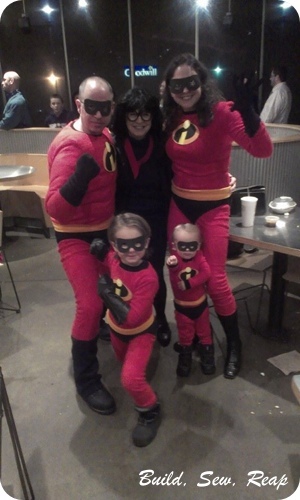 All at once, we introduced him to The Incredibles and convinced him the whole family could dress up. He was all for it and immediately started calling himself Dash and running around at high speeds everywhere he want. I created each of our costumes out of fleece to keep us all warm on what I expected to be a typical cool Halloween night. I rarely sew with patterns anymore so I just winged it to make each outfit fit nice and snug. My husband borrowed a muscle suit from a friend and we all sported our favorite boots. I'll try to write up a post on making costume gloves. It was quick and easy! Of course, I took about 30 photos of each member of the family in order to put that image together but everyone enjoyed trying out their costume for a bit and posing for the camera (my kids are hams). While everyone was surely tuckered out, even the little dude managed to muster up a cool super-guy pose. I hope your Halloween as as enjoyable as ours. I know we sure made some great family memories with this one. Thank you. They still wear their costumes although little Jack Jack now wears his big brother's costume. Big brother can still stuff himself into his own costume but clearly they can't at the same time. 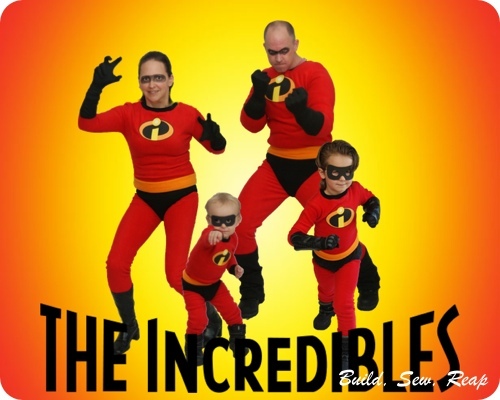 I love that my little dude was just 1.5 when we were the Incredibles and yet he still seems to remember it fondly and loves to dress up as Jack Jack.